Italian cuisine has so much to recommend it – fresh herbs, rich tomato sauce, and the earthy, spicy flavor of olive oil. Just smelling this recipe is a treat: close your eyes and take a deep breath while you’re cooking it, and you can almost hear the wind in the trees and the sun on your face. It’s a pity that “Italian food” in the US so often means huge plates of cheap pasta with sugary, weak tomato sauce (or worse yet, greasy pizza full of seed oils), because it’s actually a very Paleo-friendly food culture. In real Italian food, pasta is more of a side dish than the main event of a meal, and there are plenty of fresh fruits and vegetables with every meal. Of course, another feature of Italian cuisine is the copious use of olive oil, the staple fat of the famously healthy “Mediterranean Diet.” Olive oil is full of healthy monounsaturated fat and all kinds of antioxidants; it’s one of the best fats you can use. When you’re choosing an olive oil, make sure to buy a high-quality kind (extra virgin) to get the most out of these benefits: the cheaper oils aren’t nearly as delicious, or as healthy for you. 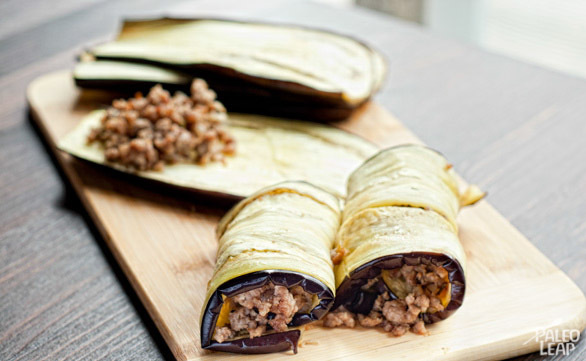 In this version of cannelloni, thin eggplant slices replace the typical tubes of pasta. Working with the eggplant slices is a little tricky, so take your time and handle them carefully. Make sure not to cut your slices too thin, or they’ll fall apart when you try to roll them up. Overcooking them will have the same effect, so keep an eye on the oven and take them out when they start getting a little brown. If you buy your tomato sauce from the grocery store, watch out for high fructose corn syrup and other unwelcome additives; tomato sauce is much tastier and healthier without a bunch of added sugar. The best option is really to make it yourself, which is not only healthier, but also much tastier. The next time your friends want to head out to Olive Garden for all-you-can-eat breadsticks, this recipe might help you convince them that there’s a life after grains, and that their favorite foods aren’t off-limits on Paleo after all! SERVES: 4 PREP: 30 min. COOK: 35 min. In a large skillet over a medium heat, warm 1 tbsp. of olive oil and sauté the ground beef with half the shallots, half the garlic, the rosemary, and the oregano. Cook until the meat is evenly browned. Season to taste, and set aside. 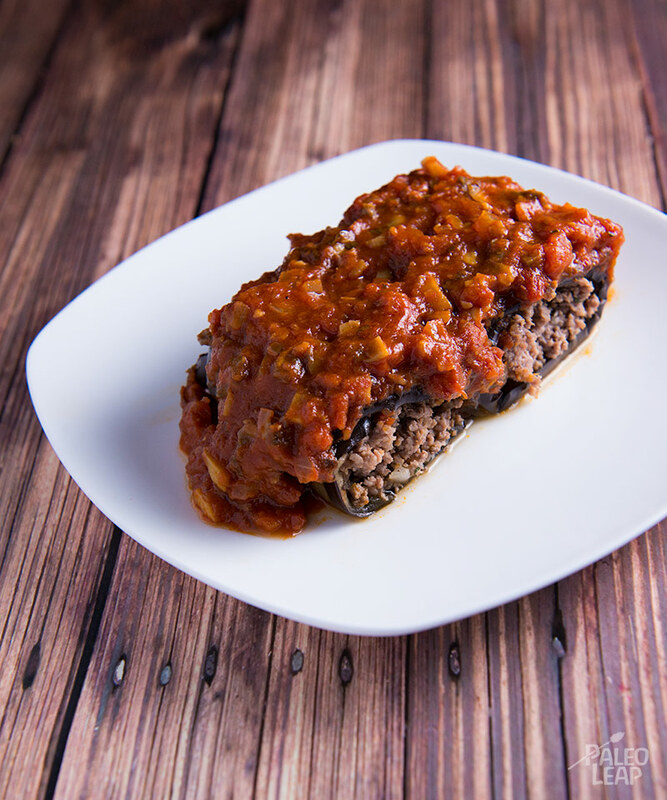 Once the eggplant slices are cool, place the meat mixture at the edge of each slice of eggplant and roll the eggplant around the meat. Place the cannelloni in a roasting pot, and cover with the tomato sauce. Place in the oven and cook for another 15 minutes. Serve and enjoy.